Be the first to share your favorite memory, photo or story of Phyllis H. &. This memorial page is dedicated for family, friends and future generations to celebrate the life of their loved one. Essex Junction - They journeyed to heaven the way they traveled through life, together. 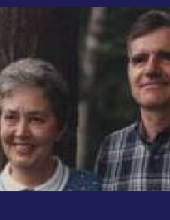 Phyllis H. White and Lee W. White passed away four days apart in early January 2019. They were both 89 years old. Phyllis died after a month-long battle with pneumonia. Lee lost his struggle with influenza after learning of his wife's passing. They were married 68 years. Phyllis was born in Somerville, Ma, the daughter of Everett and Helen (Jones) Hayden. She completed her RN degree at Mary Hitchcock Memorial Hospital School of Nursing in New Hampshire. In the 1960's Phyllis worked as a nurse at Fanny Allen Medical Center in Colchester, VT. She then worked as a lab technician in the Animal Pathology Department at UVM in the 1970's and 1980's. Lee was born in Enosburgh, VT, the son of Norman and Hazel (Maynard) White. His family moved to Bradford, VT where he completed high school. In the 1950's, Lee worked for several years at Cabot Creamery. He then worked 30 years in the Biochemistry department at UVM as a lab technician and instructor all while earning his B.S. degree and raising his young family. The couple met when Lee was a patient at Mary Hitchcock Memorial Hospital where Phyllis was completing her nurse's training. Throughout their marriage, rarely was one seen without the other. They commuted to their respective jobs at UVM together, lunched together and after retirement shared their days together. And now they remain together in the afterlife. Both were preceded in death by their parents and Lee preceded by his brother Dean White of Springfield, MA and sister Lorraine Gulick of Ely, VT. The couple leaves behind their devoted children, daughter Wendy Gordon (husband Jeffrey) of Springfield, OR, son Jeffrey White (wife Jill) of St. Albans, VT, son David White of Phoenix, AZ and daughter Jill White (husband Rodney Brown) of Cedar Park, TX. They are also survived by grandchildren, Jonathan Gordon, Heather Gordon Sprague, Iain White, Jennifer White and Alyssa White, four great grandchildren and several nieces and nephews. Lee is also survived by his brother N. Bruce White of N. Carolina. Burial and memorial service will be held in Bradford, VT in the spring. Charitable donations on behalf of Phyllis may be made to St. Jude Children's Research Hospital, 501 St. Jude Place, Memphis, TN 38105-9959 and on behalf of Lee to Disabled American Veterans, P.O. Box 14301, Cincinnati, OH 45250-0301. To send the White family a message of condolence or share a memory, kindly go to their on-line guest book at www.healdfuneralhome.com. To plant a tree in memory of Phyllis H. & Lee W. White, please visit our Tribute Store. "Email Address" would like to share the life celebration of Phyllis H. & Lee W. White. Click on the "link" to go to share a favorite memory or leave a condolence message for the family.